Exhilaration, elation, happiness, pride, and attitude -- these are words that would describe the feeling of being on top of the world. To me that feeling means that you have conquered an obstacle or achieved a goal. It may mean that you have helped others do the same. When you feel on top of the world, you are able to accomplish more than you anticipated, but staying in that feeling is difficult because outside stimuli can knock you down. We all experience obstacles in our life -- grief, hardship, or loss. I'm sure, however, that you've read stories about people who have been homeless, poor, abused, but are now productive and successful. 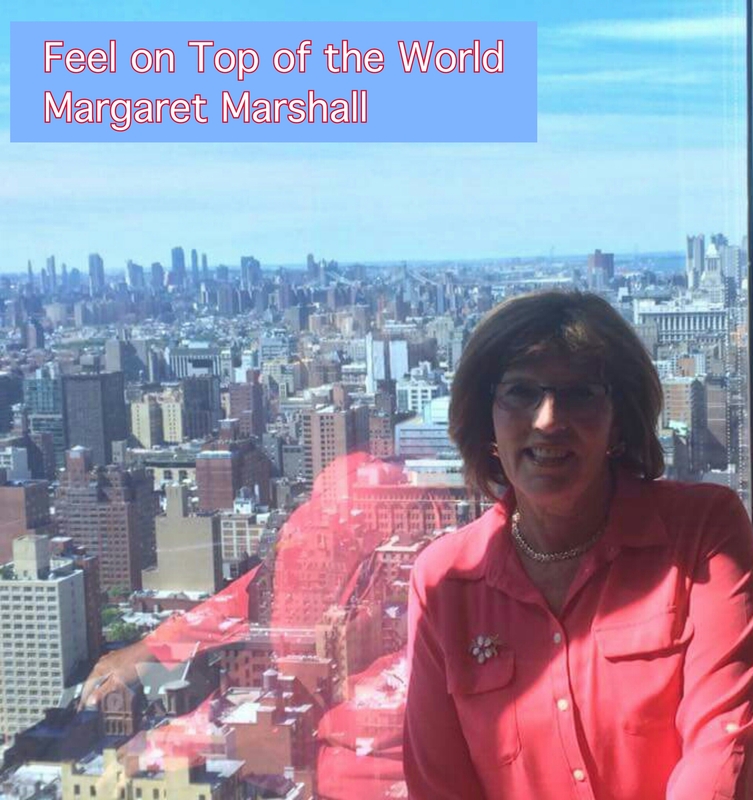 How do you achieve that top of the world feeling, and how do you stay there? Good Health: With good health you can achieve anything; without it your dreams will not be realized. You need stamina, a good mindset, focus, and a healthy body to feel on top of the world. Think of a day when you have a headache. It stops you from performing at your best, it clouds your focus, and your reactions to others are jeopardized. Imagine if your health is worse than a common headache. Everything suffers and your dreams and goals are unrealized. The time and effort you invest in your health will pay off in multiple ways. Start with a healthy diet; food is fuel when chosen wisely. Include activity, spend time with positive people, sleep well, get age-appropriate medical tests, and start each day in a healthy way. Be Grateful: Evaluate your life and celebrate what you are grateful for. Too often we feel grateful, but then allow another event to wipe the feeling away. Hold tight onto the grateful feelings and keep expanding on them. Each morning as I set out on my walk, I am grateful for the ability to walk. That starts my mindset of gratefulness; I can then let it expand as the day unfolds. Once you learn how to stay grateful and celebrate the small and the paramount moments alike, your attitude will change. You will believe you are capable of greatness and will look for avenues to achieving your dreams. When you look for them optimistically, opportunities appear. Help Others: Guide others to avoid setbacks that they need not experience. Join an association or a charity where you feel an attachment to the cause. Here you can guide people you have never met who will welcome your assistance. Or you can look close to home and help those you love. Either way, helping others will elevate your feelings from within, but only when it's done with sincerity and good intentions. Be an Integral Member of Your Community: Choose a cause that you have a passion for and would like to be associated with. Become a volunteer in your hometown. This does not have to be tied to your profession, but to your beliefs. In fact, it could be a respite from your profession. But you may find this role makes a big difference in teaching you new strategies and techniques for your line of work. I realized this through personal experience. In the early 1990s, I joined my church's parish council and worked hands-on with fund raising, event planning, grounds-keeping, holiday celebrations, budgeting, and food pantries. These activities honed my leadership skills. Within three years I was asked to be the chairman of the parish council. At that point the council changed the title to chairperson because I was the first, and to date, the only female chair of the parish council in their 120-year history. Leave a legacy: Write your own obituary and then live it. Describe who you are and what you want to be known for. If you want to be seen as caring, you'll need to care about others. If you want be known as loving, you must exhibit love. Pick what you want to be remembered for. Years ago I picked my word. Whenever I hear someone describe me with my word, I know that I am accomplishing it. Never Let anyone's Illness Invade Your Wellness. Step out and help others whenever possible, but remember there are those who can drain you with their neediness. Once you feel your wellness is being invaded, reevaluate the situation. Stay on top of the world. Only from that perspective will you prosper and invite others to do the same.